Epilepsy is one of the most common neurological problems worldwide., Its prevalence rate varies from 2.8 to 19.5/1000 people, and nearly 80% of the people with epilepsy are found in developing countries. Adequate education is considered as a fundamental element in its handling. Families with an epileptic patient, in their members, are at great risk of having anxiety that significantly connects with their feature of life. Hence, increased parents' knowledge about epilepsy is correlated with reduction in anxiety. Furthermore, family activities are more elaborated if they are more knowledgeable and exhibit less fears regarding own epileptic patients. Less social isolation and depressive symptoms are also associated with increased knowledge of epilepsy. Indeed, families' attitudes toward patient with epilepsy are considerably influenced by the depth of their knowledge. Nonetheless, epilepsy is poorly understood by the people, even among those who know someone with the complaint. Lack of the knowledge about epilepsy is a leading cause of discrimination in schools, social events, and workplaces. Thus, for optimal care and management, all misinformation and misconceptions, such as preventing the patients from participating in social activities, such as sports or going to school, should be properly clarified. This will positively improves the interrelation of the whole society. In this regard, studies have demonstrated certain doubts concerning epilepsy not only because of its health implications but also for its social, cultural, psychological, and economic effects. In general, misconceptions are reported more frequently from developing countries., In Libya, epilepsy has a higher prevalence rate of 230 cases/105 people. However, families are not rightfully informed regarding epilepsy and its cognitive effects. As a consequence, parents will experience negative attitude toward epileptic patients. To the best of our knowledge, no previous studies, in Tripoli, discussed this issue among nonepileptic population. Therefore, the present study was designed to evaluate the knowledge about and attitude as regards epilepsy among Libyan parents without epilepsy. The present study is a community cross-sectional, descriptive in design, among adult Libyan parents resident in Tripoli town, Libya, as regards epilepsy. Tripoli is a city where people from similar sociocultural backgrounds live. The Tripoli city Libyan populations were estimated to be one million. Roughly, the average Libyan family members were five persons per family. Thus, we guessed that parents are about 200,000 thousand people. Therefore, the survey took place on a community sample of Libyan parents without epilepsy. The duration of the study was from January to July 2015. The inclusion criteria comprise Libyan; male and female, parents aged 18 years or above, had at least one child, resident in Tripoli, and who agree to participate in the study. While the exclusion criteria include non-Libyan, epileptic patients and those who were below 18 years old. A structured questionnaire composed of simple closed-ended questions, adapted from Zainy et al. and Henok and Lamaro was used to evaluate the knowledge about and attitude toward epilepsy. According to sample size calculation, 384 pretested questionnaires forms were distributed manually through face-to-face interview. To avoid bias of data, participants were selected randomly using random sampling technique. The participants were interviewed at different places at Tripoli city; primary and secondary schools, public restaurants, community pharmacy, hospitals, and private clinics. The study protocol was validated using a pilot assessment for 40 community members who were not the study participants. Few notes were inserted to modify the final form of questionnaire. The questionnaire was in two sections: the first part enquired about demographics of included subjects (2 items) and the source of their information and the second part explored the knowledge (10 items) and attitudes (8 items) toward epilepsy. A trained researcher (coauthor) interviewed the participants and collected the filled-in questionnaires. The study design and questionnaire items were critically discussed and ethically approved by the Faculty of Pharmacy, University of Tripoli. Written informed consent was obtained from all responders before the study establishment. The sample size was determined using single population proportion formula (Raosoft; sample size calculator program). All data were collected from the entire participants. Statistical analysis was performed using GraphPad Prism statistical software (GraphPad Software Inc., San Diego, USA). Descriptive analyses were executed, the positive answer (Yes) takes score 1 and the negative answer (No) takes score 0. All the results are presented as number of frequency and the proportions (%) to the total patients. The variables were examined using Chi-square test. Statistical significance was set when P < 0.05. A total of 384 parents were interviewed, 379 individuals completed the administered questionnaire giving a 98.7% response rate; 205 parents (54.1%) were female and 174 (45.9%) were male. All respondents (100%) are of Libyan nationality and residents in Tripoli city. The parents' age ranged between 18 and 79 years (the median age is 34 years). The majority of parents were in the age range of 24–36 years (78.1%). [Table 1] shows the results related to the knowledge questions. Among the study participants, 344 (90.8%) had heard about epilepsy, mostly from word of mouth (40.4%), followed by mass media in 18.2% of parents. Additional sources of information include books and magazines (15.0%) and internet (12.1%), while from other sources were 14.2%. The majority of parents (80.7%) believed that epilepsy is a hereditary disorder whereas 43.5% of parents stated that epilepsy is a contagious disorder and 54.6% think that epilepsy is a mental disease, while 70.4% considered that epilepsy as a possession by evil spirits. Furthermore, 366 parents (96.6%) reported that epilepsy would influence patient self-confidence. About the treatment of epilepsy, our results showed that 43.5% of parents declared that epilepsy is a treatable disease but patient will not be entirely cured. 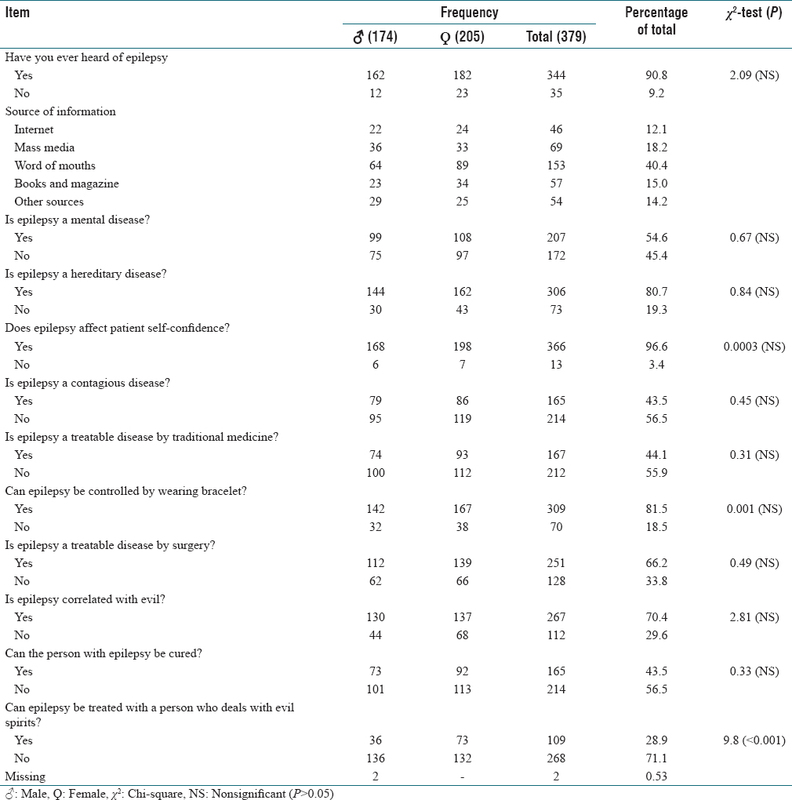 One hundred and sixty-seven parents (44.1%) reported that epilepsy is treated by traditional medicine, whereas 309 of parents (81.5%) believed that wearing bracelet, without any scientific reason, can reduce seizure attacks, and 251 participants (66.2%) knew that epileptic patient can be improved by surgery [Table 1]. Besides, 28.9% (female:male – 2:1) of the study participants mentioned that people with epilepsy should go to person who deals with evil spirits as underlying type of treatment [Table 1]. Although the study parents mention that they did not know the exact cause of the disease, they agreed that it occurs naturally. Congenital brain malformation, trauma, and brain cancer were identified as the cause of epilepsy by 21.9%, 20.4%, and 6.8%, respectively (data not shown). Whereas, 23.9% thought that epilepsy is possessed with supplement power. Overall, with the exception of the spiritual healing of epilepsy, gender did not play a significant role (P > 0.05) in the parents belief. 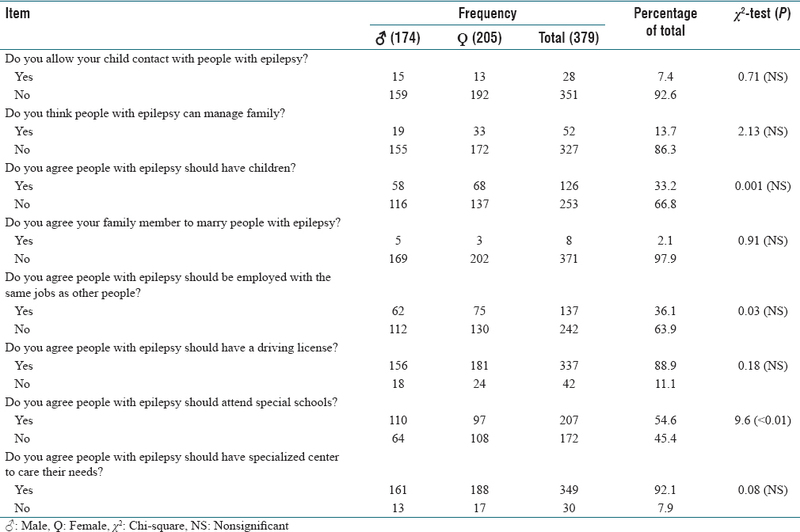 Parents' attitudes as regards epilepsy are shown in [Table 2]. As can be seen, Libyan parents had negative attitude toward epilepsy since 253 (66.8%) of the participants had reported that people with epilepsy should not have children. Furthermore, the majority of parents (351; 92.6%) agreed to keep their children away from people with epilepsy, and 327 (86.3%) stated that, unquestionably, do not want family member to marry epileptic patient. Besides, more than four-fifths of parents (327, 86.3%) did not think that patient with epilepsy can manage family. Of the study parents, 242 (63.9%) mentioned that they did not agree to work with people with epilepsy and reported people with epilepsy should not be employed with the same job as other people, in particular, that needs full attention, automachine handler included. As well, they should not get a driving license (337 responders; 88.9%). Of the participants, more than half of parents (207; 54.6%) stated that people with epilepsy should attend special schools and 349 (92.1%) mentioned that people with epilepsy should have specialized center to take care of their needs [Table 2]. In addition, our results show that with the exception of whether people with epilepsy needs special school or not, parents attitude as regards to epilepsy was not gender associated (P > 0.05) [Table 2]. In the present study, four-fifths of the parents had heard about epilepsy. This finding is comparable to that in other studies, for instance, South African, Brazilian, and Ethiopian studies, and much higher than the Iranian and Saudi Arabia studies (90.8% ours vs. 76.6% and 70%, respectively). This observation points to the higher awareness of epilepsy among the participants. However, the present study shows that Libyan parents are not well knowledgeable, have significant misconceptions and negative attitudes toward epilepsy. While most parents generally felt informed about epilepsy, many believed that epilepsy is a mental disease, correlates with evil, affects patients' self-confidence, and patient is not entirely cured. The observation that epilepsy is a mental disease was comparable with the findings from studies conducted at UK and Saudi Arabia. However, the Iranian study showed much less frequency of such a belief (16.9% vs. ours 54.6%). The difference could be attributed to cultural discrepancies. Herein, less than half of the study participants reported that epilepsy is treatable by traditional medicine. This was lower than the Saudi Arabian and Ethiopian findings., The difference could be related to that more than 50% of our study parents believed that epilepsy is not a curable disease. This parents' belief was also observed at high frequency than that reported in an Indian study (21% vs. ours 56.5%). The high education level among the study sample of the latter studies,, might have contributed to this difference. In addition, the present study demonstrated the possibility that the low illiteracy rate among the study area (literacy rate (LR) = 91.4%) might influence the belief that epilepsy is a contagious disease is not clear as compared to Brazilian (LR = 92.6%), Lao People's Democratic Republic (LPDR; LR = 79.9%), and Ethiopian (LR = 49.1%) studies, (2% 33.3% and 49%, respectively, vs. ours 43.5%). Consistent with others,, we found certain doubts in parents' mind regarding epileptic patients. It has been indicated that epileptic patients are not as bright as healthy people. The misconception that epilepsy is controlled by evil spirit observed in this study and by others, have a remarkable negative influence on the medical management of the disease with a serious risk of inaccurate compliance. In addition, the findings that some parents believe that epileptic patient should register in a special school, considered that people with epilepsy always exposed to attacks, and that epilepsy is contagious, are in line with the misconceptions frequently reported from developing countries., In contrast to the findings by Parmar et al., the present study demonstrates that the sociodemographic data, in particular, gender factor did not play a role in knowledge and attitudes of Libyan parents, resident in Tripoli city, with regard to epilepsy. Up to 81.5% of parents conceded to use nonmedical therapy for epilepsy, in particular, wearing bracelet and using traditional medicine. These could be explained by the parents' belief that epilepsy is a mental disorder and correlates with evil. The parents' attitude observed in this study, in particular, that “not allowed their children to have contact with people with epilepsy; people with epilepsy cannot manage family; people with epilepsy should not have children and they do not agree to get married with people with epilepsy” revealed that epileptic patients are at high risk of social discrimination and will not achieve a lot in the future. The observation that more than four-fifths of our study sample reported to keep their children away from epileptics is in agreement with the Italian study by Savarese et al. but considerably higher than findings from the UK study (1.5% vs. our 92.6%). The difference, to the UK study, could probably be due to the variation in the studies sample since our study was conducted among the community, whereas the UK study was done among dentists who have better education. The Ethiopian and the LPDR studies also showed less attitudes regarding this variable than us and this difference could probably due to cultural discrepancies. In this study, the majority of parents did not agree to permit their family members to marry people with epilepsy. In the UK and LPDR studies, this variable was reported less frequently, with 5.2% and 27.8% compared to 86.3% in the present populations. This difference could be attributed to that more than 80% of our study participants believed that epilepsy is a transgeneration disorder. However, our observation was comparable with the findings from a study conducted in Ethiopia, which was 79.6%. The differences in literacy and culture may contributes in the disparity that epilepsy is a heredity disease compared to others; Pakistani (8.8%/LR = 57.9%) and Nigerian (19.1%/LR = 59.6%) studies vs. ours 80.7%/LR = 91.4%. The present study has its limitations that have been raised during interpretation of the findings. First, since the study population was drawn from parents in Tripoli city, it does not reflect the view of all Libyan population. This may present special difficulty in the study sample. Indeed, however, it was expressive of a wide range of several traditions with a high response rate. Thus, our findings may be considered to be descriptive of the Libyan populations. Second, recall bias by some parents may have affected the findings as the questions on knowledge and attitude are predisposed to individual judgments. Nonetheless, the authors have tried to overcome this puzzle by a random selection of patients and assist all parents in fulfilling the questionnaire. A third limitation is that the study failed to evaluate the parents' education level on the knowledge and attitude toward epilepsy. However, despite this limitation, this study provides valuable information for future studies in this field. The present study demonstrates that many parents have low knowledge, remarkable misconception, and their attitude toward epilepsy is not appropriate. Gender status was not associated with parents' knowledge and attitudes. The level of knowledge and belief needs great improvement since the parents' misconception probably generates risk implications during medical management. At the same time, right beliefs will enhance the community positively and improve the link with people with epilepsy. Media and government authorities need to plan to provide community education about epilepsy. Such programs should target all parents in ameliorating misconceptions, minimizing the social stigma, and ultimately improve the parents' attitudes. The authors would like to express their great thanks to all parents who did participate in this study. Jan MM. Perception of pediatric neurology among non-neurologists. J Child Neurol 2004;19:1-5. Jan MM. Clinical review of pediatric epilepsy. Neurosciences (Riyadh) 2005;10:255-64. Sander JW. The epidemiology of epilepsy revisited. Curr Opin Neurol 2003;16:165-70. Li Y, Ji CY, Qin J, Zhang ZX. Parental anxiety and quality of life of epileptic children. Biomed Environ Sci 2008;21:228-32. Hirfanoglu T, Serdaroglu A, Cansu A, Soysal AS, Derle E, Gucuyener K, et al. Do knowledge of, perception of, and attitudes toward epilepsy affect the quality of life of turkish children with epilepsy and their parents? Epilepsy Behav 2009;14:71-7. El Sharkawy G, Newton C, Hartley S. Attitudes and practices of families and health care personnel toward children with epilepsy in Kilifi, Kenya. Epilepsy Behav 2006;8:201-12. Westphal-Guitti AC, Alonso NB, Migliorini RC, da Silva TI, Azevedo AM, Caboclo LO, et al. Quality of life and burden in caregivers of patients with epilepsy. J Neurosci Nurs 2007;39:354-60. Prpic I, Korotaj Z, Vlasic-Cicvaric I, Paucic-Kirincic E, Valerjev A, Tomac V, et al. Teachers' opinions about capabilities and behavior of children with epilepsy. Epilepsy Behav 2003;4:142-5. Saengpattrachai M, Srinualta D, Lorlertratna N, Pradermduzzadeeporn E, Poonpol F. Public familiarity with, knowledge of, and predictors of negative attitudes toward epilepsy in Thailand. Epilepsy Behav 2010;17:497-505. Frank-Briggs AI, Alikor EA. Knowledge and attitudes of parents toward children with epilepsy. Ann Afr Med 2011;10:238-42. Yemadje LP, Houinato D, Quet F, Druet-Cabanac M, Preux PM. Understanding the differences in prevalence of epilepsy in tropical regions. Epilepsia 2011;52:1376-81. Vona P, Siddarth P, Sankar R, Caplan R. Obstacles to mental health care in pediatric epilepsy: Insight from parents. Epilepsy Behav 2009;14:360-6. Zainy LE, Atteyah DM, Aldisi WM, Abdulkarim HA, Alhelo RF, Alhelali HA, et al. Parents' knowledge and attitudes toward children with epilepsy. Neurosciences (Riyadh) 2013;18:345-8. Benamer HT, Grosset DG. A systematic review of the epidemiology of epilepsy in arab countries. Epilepsia 2009;50:2301-4. Henok A, Lamaro T. Knowledge about and attitude towards epilepsy among menit community, Southwest Ethiopia. Ethiop J Health Sci 2017;27:47-58. Available from: http://www.raosoft.com/samplesize.html. [Last accessed on 2011]. Mangena-Netshikweta ML. Perceptions about epilepsy in the limpopo province of the republic of South Africa. Curationis 2003;26:51-6. Dantas FG, Cariri GA, Cariri GA, Ribeiro Filho AR. Knowledge and attitudes toward epilepsy among primary, secondary and tertiary level teachers. Arq Neuropsiquiatr 2001;59:712-6. Ghanean H, Nojomi M, Jacobsson L. Public awareness and attitudes towards epilepsy in Tehran, Iran. Glob Health Action 2013;6:21618. Aragon CE, Hess T, Burneo JG. Knowledge and attitudes about epilepsy: A survey of dentists in London, Ontario. J Can Dent Assoc 2009;75:450. Surendran S, Maheswaran S, Gonsalves J, D'Souza PJ, Balaji K. Knowledge of epilepsy among IInd year students of medical fraternity. Int J Adv Sci Res 2015;1:186-90. World Data Atlas. Available from: https://www.knoema.com/atlas/Libya/topics/Education/Literacy/Adult-literacy-rate. [Last accessed on 2015]. World Data Atlas. Available from: https://www.knoema.com/atlas/Brazil/topics/Education/Literacy/Adult-literacy-rate. [Last accessed on 2015]. World Data Atlas. Available from: https://www.knoema.com/atlas/Lao-Peoples-Democratic-Republic/topics/Education/Literacy/Adult-literacy-rate. [Last accessed on 2015]. Index Mundi. Available from: https://www.indexmundi.com/g/r.aspx?c=ly&v=39. [Last accessed on 2018 Jan 20]. Harimanana A, Chivorakul P, Souvong V, Preux PM, Barennes H. Is insufficient knowledge of epilepsy the reason for low levels of healthcare in the lao PDR? BMC Health Serv Res 2013;13:41. Savarese G, Carpinelli L, D'Elia D, Coppola G. Teachers of various school grades and representations of epilepsy: Problems, relational aspects and perspectives of life quality. Ital J Pediatr 2015;41:70. Naeem F, Ayub M, Kingdon D, Mujtaba M, Zaidi QA, Bhatti F, et al. A survey of knowledge and attitude of the general public towards epilepsy in Lahore, Pakistan. J Pak Psychiatr Soc 2007;4:96-9. Kabir M, Iliyasu Z, Abubakar IS, Kabir ZS, Farinyaro AU. Knowledge, attitude and beliefs about epilepsy among adults in a Northern Nigerian urban community. Ann Afr Med 2005;4:107-12.